It's baby Groot from Guardians of the Galaxy! Nicely detailed and movie-accurate ceramic mug. Exclusive baby Groot is ready to hold your coffee, tea, or? it's also an amazing prop replica! Entertainment Earth Exclusive! 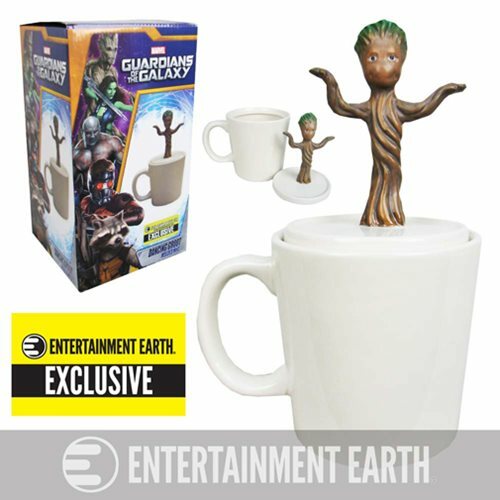 The Guardians of the Galaxy Baby Dancing Groot Figural Mug - Entertainment Earth Exclusive is a great way to hold your tea, coffee, or other beverage, and it's also an amazing prop replica! Featuring adorable baby Groot from Guardians of the Galaxy, this ceramic mug is the perfect gift for any fan of the film. Bring home your own baby Groot so he can hold your coffee! Hand wash only. Not dishwasher safe. Do not microwave. Ages 12 and up. The lid measures 4 1/8-inches tall x 3 3/4-inches in diameter, while the coffee mug measures 5 3/4-inches tall x 4-inches in diameter and can hold up to 16 ounces of liquid. The overall height of the mug with the Dancing Baby Groot Lid placed on top measures just over 8-inches tall.